Mr. & Mrs. Brian Levinson on the occasion of the bar mitzvah of their son, Jonah. A donation to Kiddush fund has been made by Eliyanah Wodika on the occasion of her father’s yahrtzeit. Mr. & Mrs. Joseph Abramchik on the birth of their first great grandchild - a daughter to their grandson, Yehudah Melech & Deena Abramchik. Mazel Tov to the first time grandparents Rabbi & Mrs. Noam Abramchik and great-great grandmothers, Gerda Abramchik and Leah Flanzer. Mr. & Mrs. Earl Brody on the birth of a granddaughter in Israel. Mr. & Mrs. Brian Levinson on the occasion of the bar mitzvah of their son, Jonah. Mazel tov to the grandparents, Mr. & Mrs. Stan Kalb, Mr. & Mrs. Sid Levinson and great-grandmother Vivian Rosen. Dr. & Mrs. Yakov Weil on upcoming wedding of their son Ephraim to Chayala Schonfeld. Program meets this week at 5:15pm. 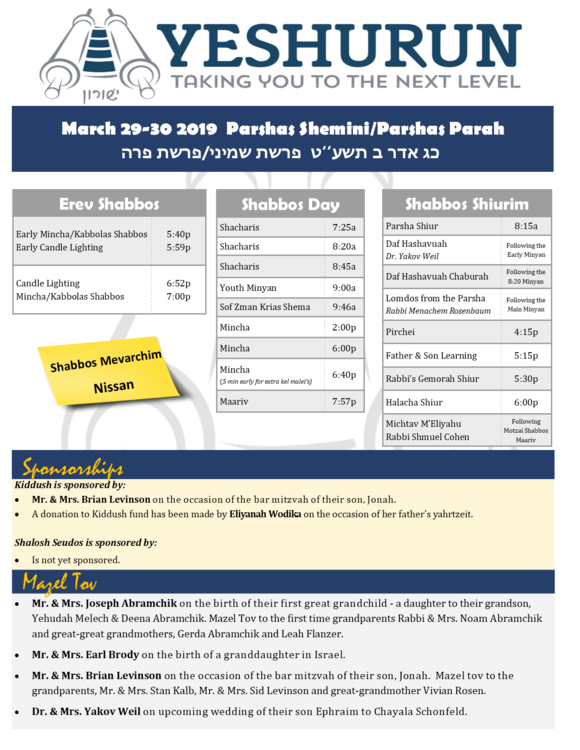 Pirchei will meet at 4:25pm Shabbos afternoon. 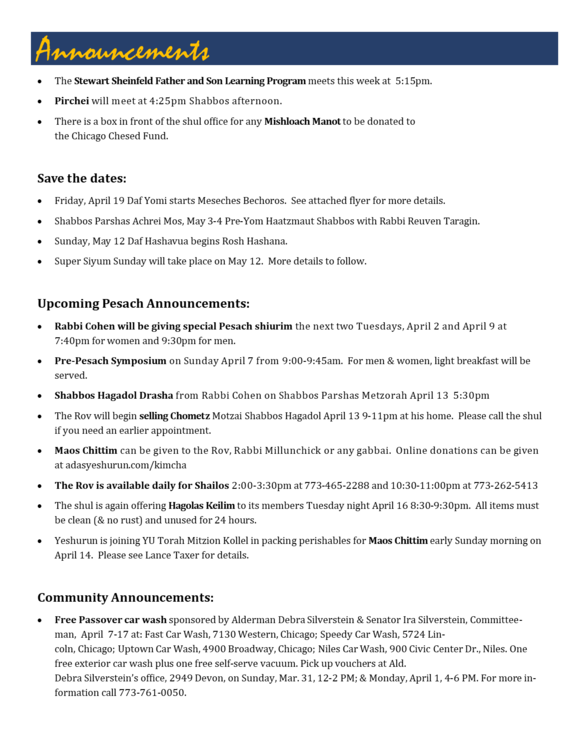 There is a box in front of the shul office for any Mishloach Manot to be donated to the Chicago Chesed Fund. 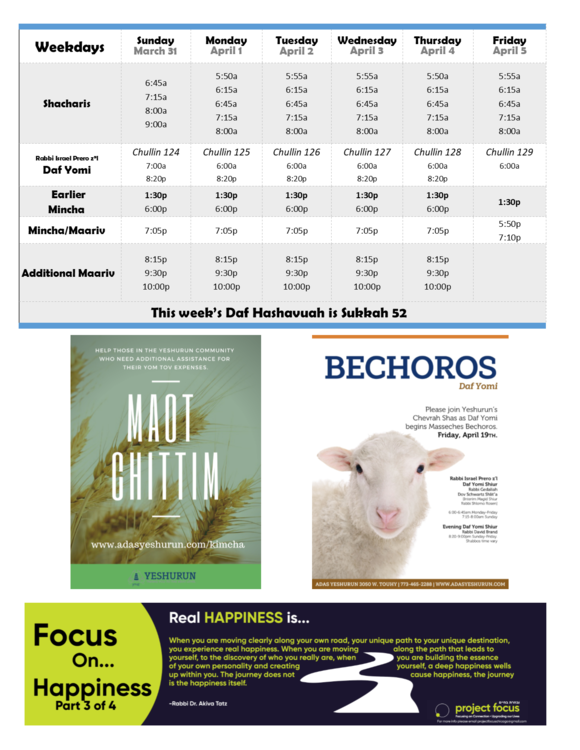 Friday, April 19 Daf Yomi begins Meseches Bechoros. Shabbos Parshas Achrei Mos, May 3-4 Pre-Yom Haatzmaut Shabbos with Rabbi Reuven Taragin. Sunday, May 12 Daf Hashavua begins Rosh Hashana. Super Siyum Sunday will take place on May 12. More details to follow. 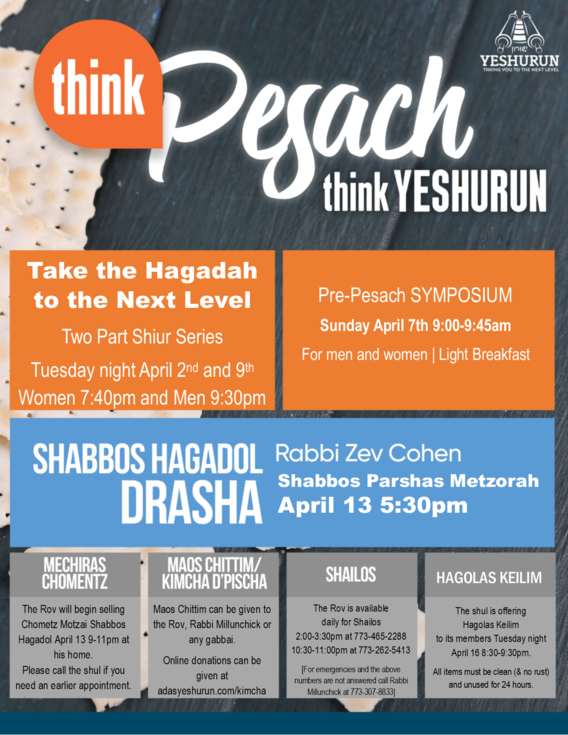 Rabbi Cohen will be giving special Pesach shiurim the next two Tuesdays, April 2 and April 9 at 7:40pm for women and 9:30pm for men. Pre-Pesach Symposium on Sunday April 7 from 9:00-9:45am. For men & women, light breakfast will be served. Shabbos Hagadol Drasha from Rabbi Cohen on Shabbos Parshas Metzorah April 13 5:30pm. The Rov will begin selling Chometz Motzai Shabbos Hagadol April 13 9-11pm at his home. Please call the shul if you need an earlier appointment. Free Passover car wash sponsored by Alderman Debra Silverstein & Senator Ira Silverstein, Committeeman, April 7-17 at: Fast Car Wash, 7130 Western, Chicago; Speedy Car Wash, 5724 Lincoln, Chicago; Uptown Car Wash, 4900 Broadway, Chicago; Niles Car Wash, 900 Civic Center Dr., Niles. One free exterior car wash plus one free self-serve vacuum. Pick up vouchers at Ald. Debra Silverstein’s office, 2949 Devon, on Sunday, Mar. 31, 12-2 PM; & Monday, April 1, 4-6 PM. For more information call 773-761-0050.